In this post we look at Paris Saint-Germain. The rich Parisian club will have invested millions into their youth setup in recent years and should expect many hot prospects to come through their academy on a yearly basis. But are there any future superstars currently learning their trade in their academy? We follow the careers of four hot prospects to have come through the PSG setup on Football Manager 2017. The Players | Who could be the next wonderkid to emerge from the academy? Christopher Nkunku is a young midfielder with bags of potential. At 18 years of age, he already possesses some very good mental attributes and will look to become a part of the PSG first team in the coming years. First team experience is vital to his continued development. Claudio Gomes is a promising midfielder who, at just 15 years-old, could develop into an effective player with decent all-round attributes. Perhaps a series of loan spells may help him to progress if opportunities are limited in the PSG first team. Dan-Axel Zagadou, a 17 year old centre-back, will be monitored closely by the hierarchy at PSG. He has great potential and already is showing signs of becoming a very good Ligue 1 defender. Presnel Kimpembe is arguably the most exciting of our four youngsters. At 20 years of age he may not develop as much as his fellow youth academy graduates but, with enough first team football, he could become a very good central defender for PSG. Five years on | Which of our youngsters has developed the best so far? A noticeable difference on Nkunku’s profile page is his change of nationality. He has been capped 11 times by DR Congo after switching allegiances away from France. He has left PSG for fellow French side AS Nancy Lorraine and helped them to return to Ligue 1 in his first season with the club. As expected, Claudio Gomes has improved significantly five years on, increasing his attributes in all areas to become a well rounded defensive midfielder. He, unlike Nkunku, remains a PSG player, albeit having spent each of the last three seasons away from the club on loan. Zagadou has benefited from several loan spells away from PSG and has developed impressively in defence. He helped Besiktas to a Turkish Cup in his most recent loan spell and will hope that more silverware awaits him as he progresses in his career. Our most exciting prospect Presnel Kimpembe has failed to disappoint. He has spent three loan spells away from Paris Saint-Germain, chasing first team minutes, but is now a first team regular with the French giants. He’ll be hoping to cement his place at the back of the PSG setup for years to come. 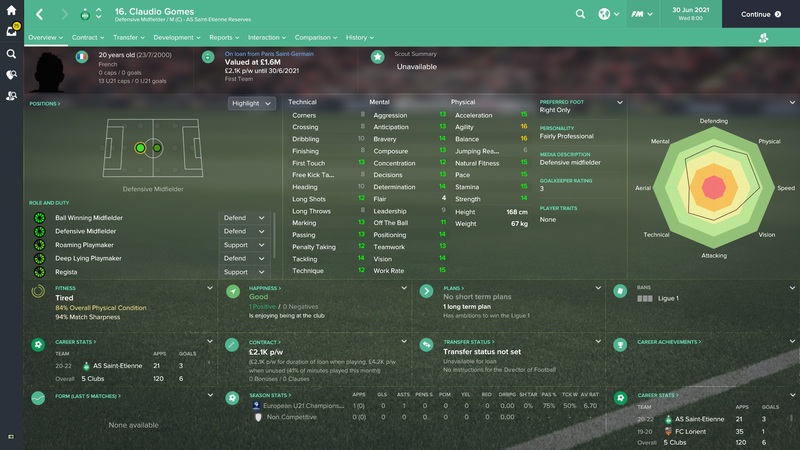 Retirement | Did our youth prospects reach their potential? Christopher Nkunku has finished his career with Russia side Amkar. 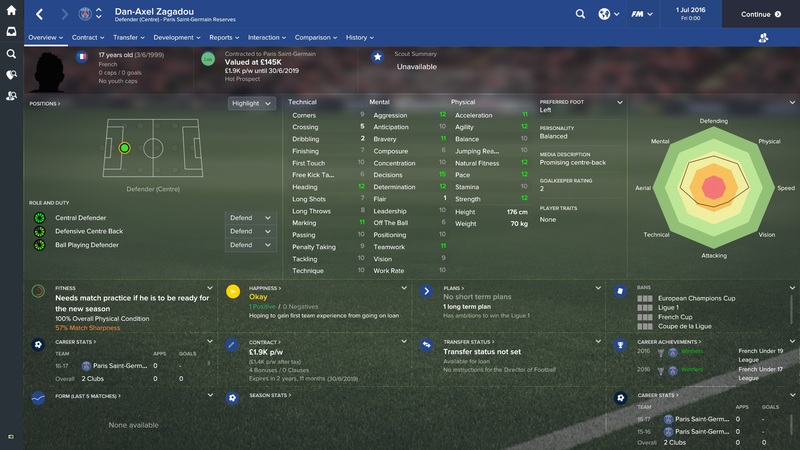 He left France in 2023 for Slovakian side Dun. Streda, playing very well for the club before moving to Russia via Valenciennes. Although he never made a name for himself around Europe, Claudio Gomes is a very well-known name around the French leagues. He spent his entire career floating between the top two tiers of France, playing the majority of his games for Stade Rennais in Ligue 1. He has won two league titles, both Ligue 2. Zagadou falls shortly behind Gomes for having made the most appearances, and, like Gomes, he is a name known more to the French leagues than anywhere else. But he did spend a season away from France in Turkey, where he won his only piece of silverware with Besiktas. Presnel Kimpembe left PSG in 2024 to pursue his dream of playing for Real Madrid. Leaving for £21.5M, the French centre-back (capped 65 times for France) went on to win three La Liga titles with Los Blancos. Adding these La Liga titles to three Ligue 1 championships and a Champions League medal with PSG, Kempembe has finished his career with a host of silverware. Thanks for reading our Paris Saint-Germain instalment of The Academies. Have you used any of these youngsters on FM17? 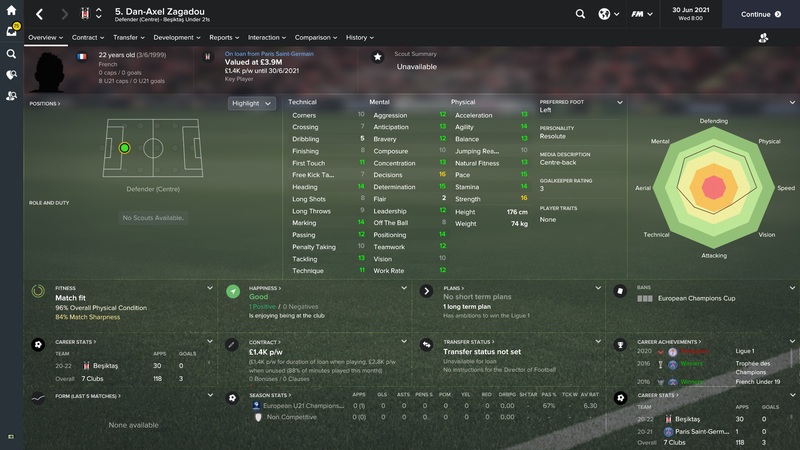 Which other PSG youth prospects have you seen develop into world-class talent? This entry was posted in FM17 Guides, Experiments & Wonderkids, Football Manager 2017, The Academies and tagged christopher nkunku, claudio gomes, dan-axel zagadou, fm wonderkids, fm17, football manager, france, presnel kimpembe, psg. Bookmark the permalink.